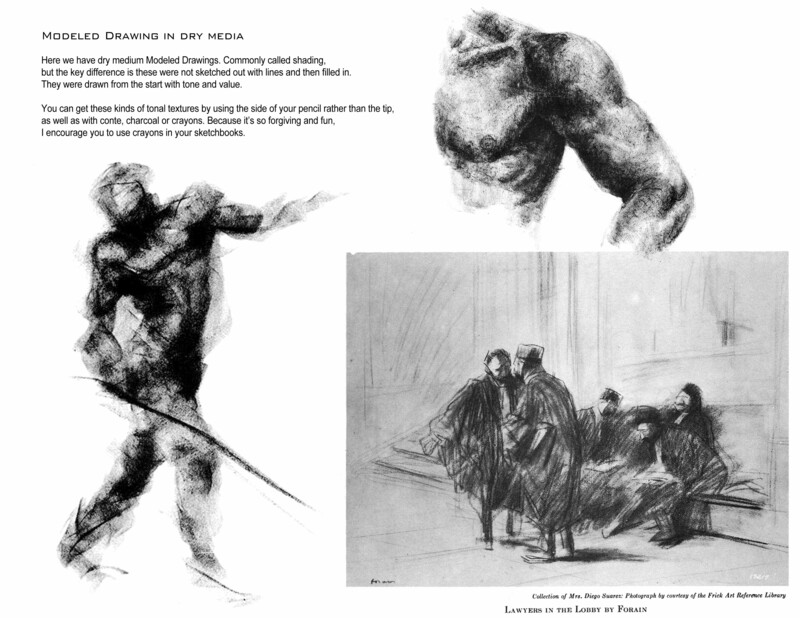 In the handouts given in our first class, and posted in Getting a grip!, I defined “Contour Drawing“, “Blind Contour Drawing“, “Gesture Drawing” & “Dynamic Gesture Drawing” [img]. Two more types of classical technique I would like to introduce to you are “Modeled Drawings” & “Continuous Line Drawings“. 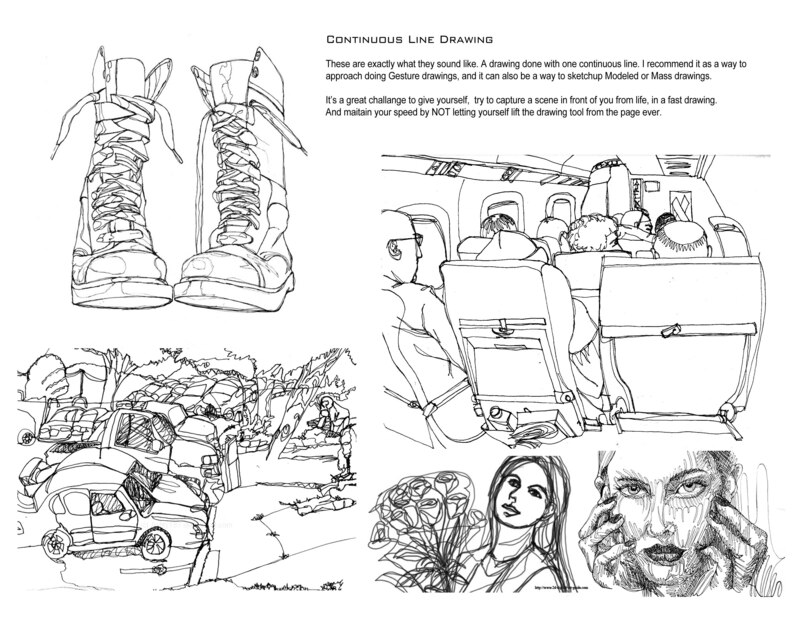 Combined with the other four, you have several common techniques that can be used alone, or together, to sketch and draw anything. I talked about different aspects of structure and process in Order & Chaos: So why do we care about identifying Contour vs. Gesture vs. Modeled drawings? If the kinds of marks we made were just random, we would not have art. Just a mess. You can mix them and match them. 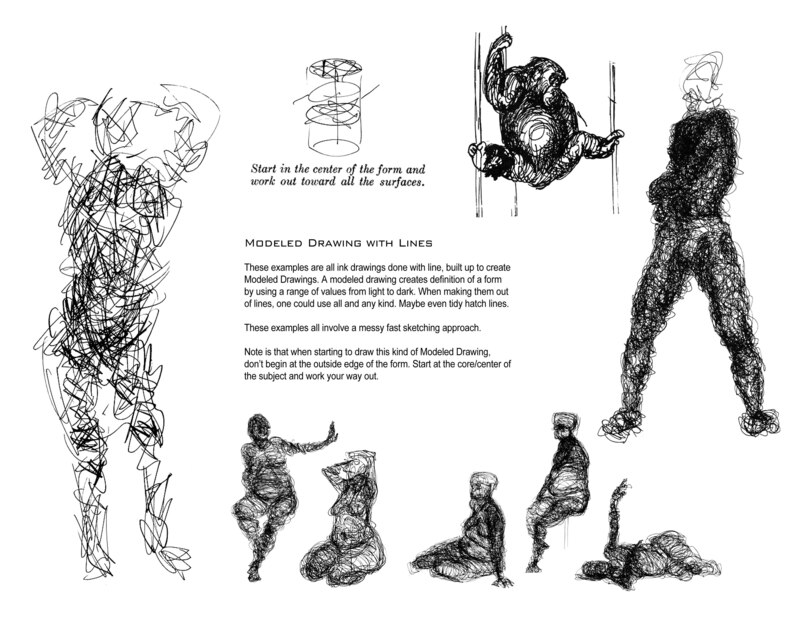 Modeled drawings can be Gestures, made of Continuous Lines. 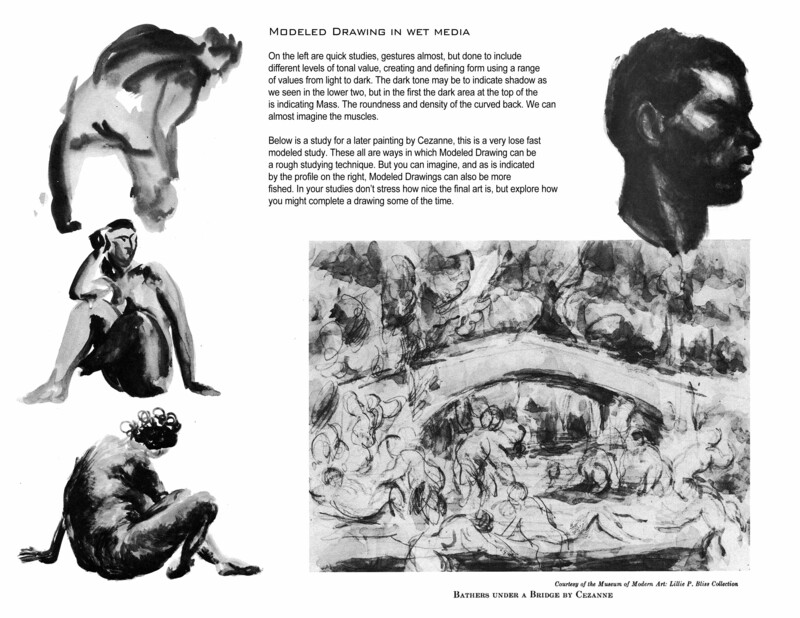 It creates a very distinctive stylistic difference, if your drawings do or don’t use Contours. And most Blind Contour Drawings are Continuous Line Drawings. But Identifying each and learning them separately lets us be conscious of their individual traits, and intentional about how we combine them or if we choose to do so at all. The end result, that personal mix, will be a big part of what you will come to think of as your own style. And for those of you who wish to be able to change styles, the kinds of lines and degree to which you combine them, will be critical in being able to achieve the different finishes you wish to achieve. “Continuous Line Drawings” are exactly what they sound like. A drawing done with one continuous line. 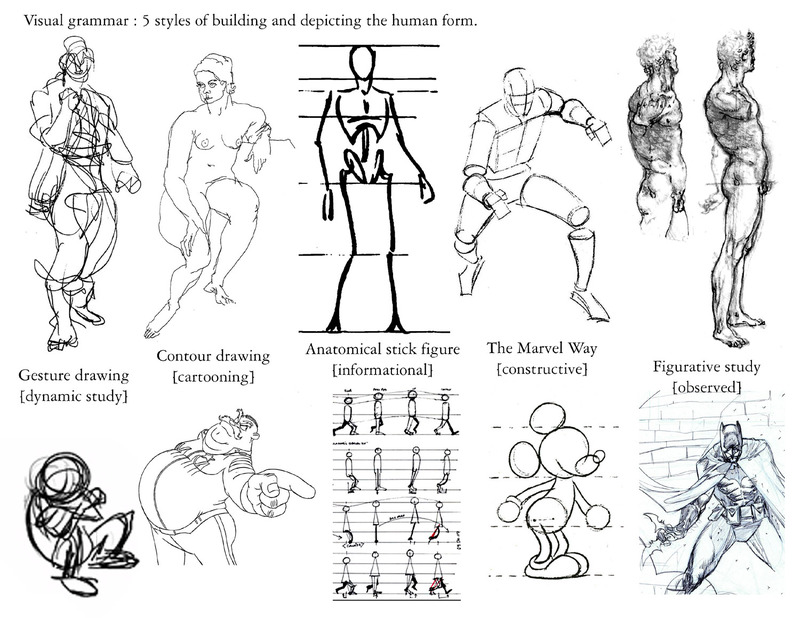 I recommend it as a way to approach doing Gesture drawings, and it can also be a way to sketchup Modeled or Mass drawings. “Modeled Drawing“, sometimes called “Mass Drawing” are drawings that involves the creation and definition of a form using a range of values from light to dark. This is commonly thought of as a finishing technique, “shading”, but I’ll show you some rough sketching examples as well. The specific version called “Mass Drawing” involves starting at the center of the subjects mass, and working your way out to the edges. So rather than attending to the edge of the subject as we do for Contours, or the movement with Gestures, here we want to think about the feeling of weight, the subjects density, and mass. Otherwise “Modeled Drawing” concerns itself with shadow, light, and texture. Generally done with something like pencil or crayons, they are also often done with wet media like ink wash, or water colour. And can be rendered with either messy, or orderly lines. The liner examples given here are all scribbly in one way or another, but you could also try to render them with clean, orderly hatch lines of different kinds as seen here in About line for tone & value. 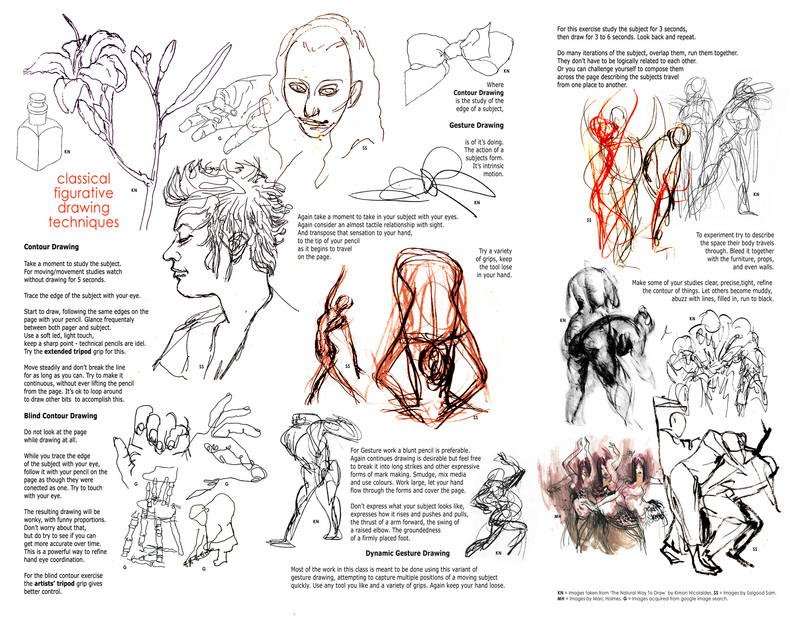 24/07/2014 | Filed under Class Blogg, Class Resources and tagged with Anatomy, DynamicDrawingGestures, Ink and linear drawing, lines, practice, Process, quick pose, sketching, study, The art of seeing, wet media.